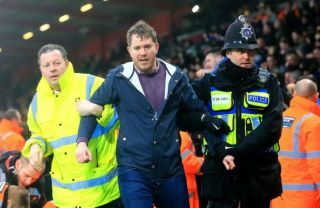 After the Jack Grealish incident last week, pitch invaders made headlines once again this weekend as they got onto Premier League pitches this time. As noted in this report and photo piece from the Sun, fans were somehow able to get onto the pitches in games between West Ham and Huddersfield, and Newcastle and Bournemouth yesterday. It’s certainly a big worry regarding security at the moment, with footballers surely needing to be better protected after Aston Villa’s Jack Grealish was actually punched by a Birmingham City supporter.